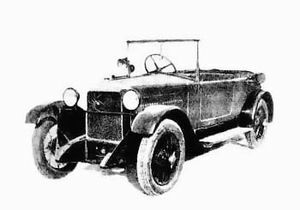 EIA (Economica Industria Automobili) was an Italian automotive manufacturer based in Milan with operations in 1928. The company developed a prototype for a small car and planed to have the standard production by several companies in Italy. But it remained only in the planning. Carrozzeria Ellena was the successor company of Mario Boano. Boano got a job at Fiat in the styling department. He therefore gave up his independence in 1954. after, he and his former business partner L. Pollo and E. Ellena, founded the Carrozzeria Ellena.